This hotel is family owned and operated, with welcoming, helpful hosts. They gave us the makings for our own breakfast; fresh eggs, bread with home made jam and honey, fruit, yogurt and coffee. Everything we needed to cook with was in the apartment. Room and balcony was extremely clean. Premises were kept up and looked very nice with well manicured trees and flowers. View from our room was very nice although we had a side sea view. There was a tent over the balcony for protection against the sun. The hostess "Gogo" and proprietor of the place was very nice and very friendly, and gave us the kindest hospitality with complementary breakfast items and fruit for our first two days. The staff was also very nice and friendly and kept our room impecable during our entire stay. 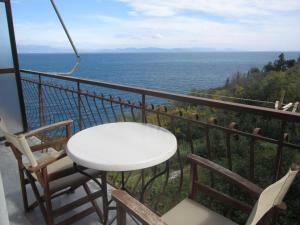 Excellent hosts, fantastic location of the property and sea views from the room. Rooms are very well maintained.rooms with a kitchette have sufficient kitchenware and dishes. Georgia and Andreas are very kind and helpful hosts and go out of the way to make you comfortable. An extremely helpful owner who's trying real hard for his property and guests. The front balcony with a spectacular view of the bay. Very privileged location. Fabulous view. Exceptionally friendly and helpful staff who spoke perfect English. Beautiful place, so clean and with stunning views. Georgia a gracious host. She provided delicious breakfast treats. The host Georigia is a most delightful lady. What an incredible welcome. As a consequence, Kalypso is a most wonderful place to stay. The rooms are large and well equipped. The view over the sea is fantastic. Interacting with Georgia is a joy and we greatly valued the warm and genuine Greek hospitality. I would definitely recommend staying here, as I will do, when I return in the future. Georgia, thank you for making our stay so enjoyable. Lovely welcome. Very clean. Brilliant view. Close to three good tavernas. We liked our stay at Calypso so much! Location is perfect - Quiet area, close to the Mavrovuni beach and is at walking distance to Githeio. It is very nice to meet friendly smiling hosts - like Georgia, who give us the kindest hospitality and helpful bits of advice. We received a nice welcome gift - a basket with a greek yoghurt, fruits, eggs and honey... - very kind! There is a private place to swim in the sea which is close and just 5 walking minutes downhill. There is a bakery with delicacies nearby. We loved our big balcony with an amazing sea view! Comfort and clean room space, refrigerator and all kitchen facilities - you have everything you need. I highly recommend Calypso! Lock in a great price for Kalypso Guesthouses – rated 9.4 by recent guests! Set amid a lush and well-tended garden, Kalypso Guest houses is located in Mavrovouni area of Peloponnese and features its own private beach and a sun terrace with free Wi-fi. It offers self-catering accommodations with a balcony overlooking the Laconian Gulf or the garden. All air-conditioned studios of Kalypso are simply furnished and include a kitchenette with fridge and cooking hobs. Bright and airy, each unit is equipped with a TV and coffee maker. The private bathroom comes with shower or bathtub. Kalypso Guest houses is located 1.2 mi from the port of Gytheio and 0.6 mi from the blue flag beach of Mavrovouni. Guests will find taverns and supermarkets within 1,300 feet of the property. Free private parking is available on site. When would you like to stay at Kalypso Guesthouses? This air-conditioned studio has a private balcony, from where you can enjoy views over the Laconian Gulf or the garden. A kitchenette with fridge and coffee maker is featured. This studio features a stovetop, tile/marble floor and air conditioning. House Rules Kalypso Guesthouses takes special requests – add in the next step! Kalypso Guesthouses accepts these cards and reserves the right to temporarily hold an amount prior to arrival. Please inform Kalypso Guesthouses of your expected arrival time in advance. You can use the Special Requests box when booking, or contact the property directly using the contact details in your confirmation. We don't like shower curtains. It would be easy to fit a shower cubicle. I suppose that's our personal preference. Any existing door at the studio was difficult to close or open without force or squeak. Weak wifi. Fabulous treat in the fridge that includes local yogurt, honey, eggs, fruit and some other items for a perfect greek breakfast. Fantastic view! Phantastic sea view. Private way to the sea and a little, little beach which offers the opportunity to a good morning swim. 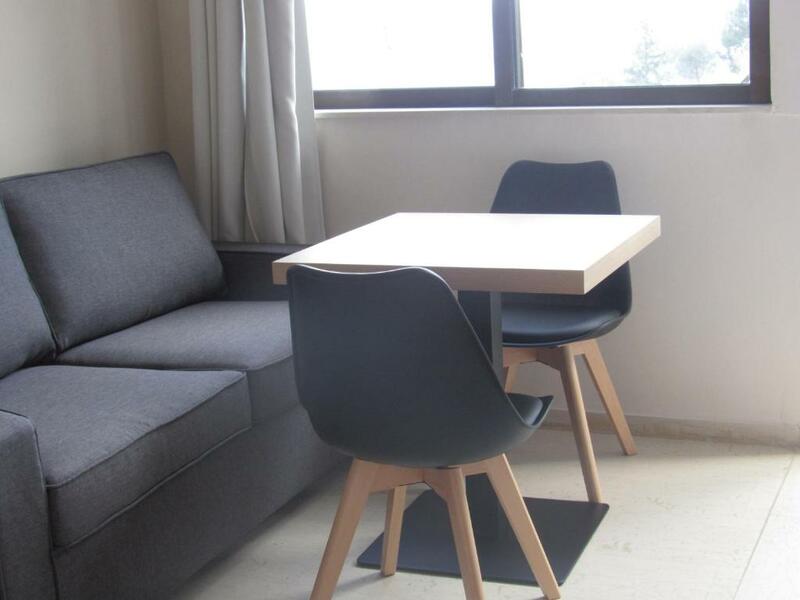 The room and furniture are simple but everything is there and clean. We had fresh greek bio joghurt with honey and nuts for breakfast which were offered by the host. Double Βed was sqeezed in a very small place and it was difficult to get in and out of bed, at least from the one side where it was almost against the wall. Mattress was OK but it certainly could be better. There were no drawers for putting clothes away such as underwear and shirts. Nothing serious. Beds could be a bit longer (this is only an issue for people larger than 1,80m) and a bit more comfortable. 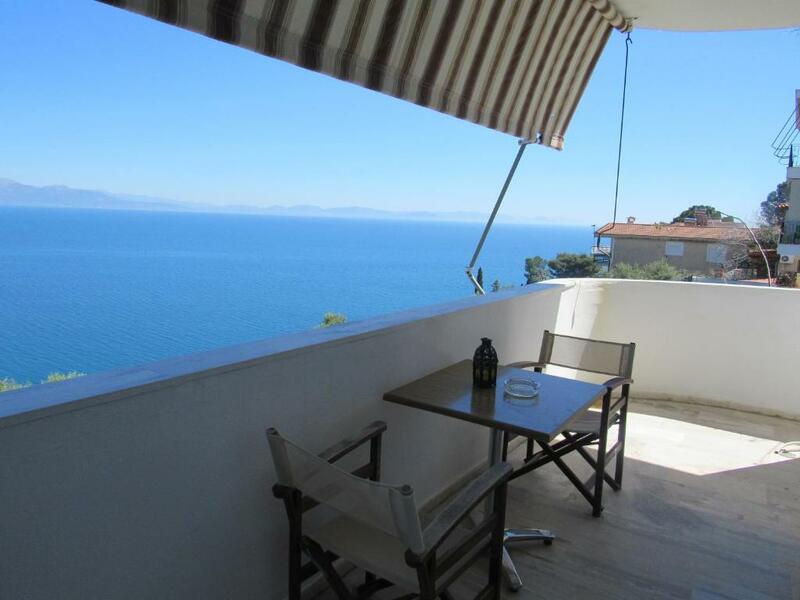 Good apartment looking over the sea a few kilometer away from Gytheio. Friendly and helpful hosts, which lets us use their washing machine. Fully equipped apartment with every you need, great terrace. Two beautiful small private beaches (one with stones, one with sand) 5-10 minutes reachable over a small path. Great bakery close by, a small mini-market and a bigger super market are also close. Not always easy to contact anyone at reception. My accommodation was at the lowest level (best view) but down a very steep drop with the addition of steps. Not east to negotiate and no-one around to assist on leaving.Reception area is way too small and used largely as a storage area. Location is perfect and the room plus hospitality "gifts" was extremely good.